True confession: I am quite a self-indulgent person. Even though I may appear to some as pious, I have arranged my life around some sacrosanct comforts which few see—and which I’ve convinced myself are actually reasonably well-deserved. Goodness, anyone who goes to Mass and prays regularly should have some slack, right? I must say, though, that even so early in our “relationship,” this new pope has rattled my cage. Benedictines have a healthy respect for Franciscan spirituality, but still believe that pantries ought to be well-stocked, closets adequately full, and beds should be comfortable. Jesus may wear the “distressing disguise of the poor,” but He also comes to visit on occasion, and likes a full-bodied wine with dinner. Hospitality is an art that can give its own glory to God—especially with the right color schemes! I knew that his brief appearance on the balcony had already made a subtle impact the morning following his election. I had fiddled with my usual bread recipe and the results weren’t impressive. In fact, the loaf was stiff and tasteless. My toast sat on the plate, defying the butter and jam that tried to mask the mistake—and my first thought was to throw the whole thing out. But a second thought quickly followed: What would Francis do? It was hard to imagine that man pitching a perfectly edible loaf of bread. The man who rode mass transit, paid his own bills, and cooked his own dinner was probably inclined to suffer the consequences of his own recipes gone awry. A “Prince of the Church” who washed the feet of the poor probably lived in closer solidarity with them than this middle-class housewife—and didn’t make excuses for his own whims. So I forced the blasted thing down and realized that the landscape in my world may have just shifted—considerably. It is entirely possible that I have hidden behind words for a very long time. The work of mercy I’ve embraced is “instructing the ignorant,” and that is something that I’ve found easy to do on a comfortable schedule in climate-controlled buildings. Even when I stay up late writing, it’s in a safe place where I toy with sentence structure and pacing—for effect. My own cozy martyrdom! No longer, I fear. While I have loved the rich philosophy of John Paul II, and delighted in the theology of Benedict, it may be time to stop talking about God and simply live a more integrated Christian life. God always provides what we need, and it appears that with this new Pontiff He has seen fit to stoke the fires of authentic charity in a distracted, materialistic world. Thus, it’s time to reassess my own gift of self, and perhaps time to shake up the whole family as well. If God’s newly-elected Shepherd has devoted himself to comforting the afflicted as a foundational expression of his Christian duty, then it stands to reason that in following his lead the reverse must come to pass as well: so the comfortable shall be afflicted. To this world of tasteless, gaudy, materialism has come an apostle of the interior castle. P. Diddy or whatever with his solid gold chain and his you know what army of poor abused women seem all of a sudden naked, poor, blind and deaf. 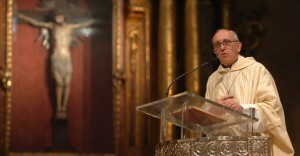 The great shock shall come when they realize that Francis is not merely gesturing. That is the way he really is. Do you know anyone who declares that he wants “to spread the wealth” and lives a selfish wealthy life himself while spreading the butter thick only on his own toast? Woe to the hypocrites that use the poor to reach the seats of power and the ditch the very ones who put them there. Watch out because the end of all that ostentatious, shameless luxury is about to arrive. Beautiful article. But will Francis introduce a new Church where there will be more social justice and Latinos will come into their own? Tomasso, this is not a world of gaudy materialism. I remember my time in the US where I was surrounded by decent hard-working Christian families who tried to bring up good children. As you know my grandson was born with health difficulties and tomorrow he will be flown from the extreme west of the European Union (Dublin) to the extreme East (Gdansk in Poland) as here is the center of excellence for his condition, which cannot be treated successfully in Ireland I thank God, insurance and the Irish tax-payer for helping him. Previously I asked members of CL for prayers. Thanks and keep them up. I will be praying for your grandson. I am sorry Mr Fitzpatrick. I should have said that this is a world of Franciscan self-denial. I have observed your comments. This must be the only site with its own official know-it-all troll. It ads a touch of laughter. I like it. I too like this site. It is good to have a touch of laughter and not to take ourselves too seriously. An official know-it-all is a good idea. She or he can point out our foibles, imperfections and lack of clarity.